Kelli Yamane graduated from Mililani High School in 2010, and will be graduating from UH Hilo in Fall 2014 with a Bachelor of Arts degree in Chemistry–Health Sciences, with minors in Biology and Computer Science. 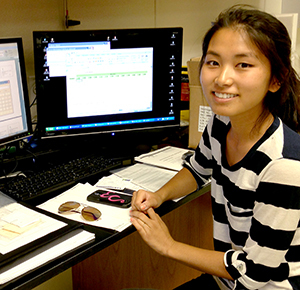 She plans to pursue a master’s degree in either Chemistry, with emphasis in Analytical Chemistry, or Computer Science. Kelli has always had an interest for science and technology, but she also enjoys traveling and doing a variety of community service. She is currently an active member in the Rotaract Club of East Hawaii, Colleges Against Cancer at UH Hilo, and Big Brothers Big Sisters of Hawai‘i Island. Project Abstract: Cellana is a private corporation that grows and develops different strains of micro-algae possessing high contents of fatty acids and protein. The company plans to sell algae biomass globally to manufacturers to make nutraceuticals, animal feed, and fuel, but currently the shelf-life, recommended storage conditions, and proper packaging are not known. A stability program was set up to test the quality of the whole algae biomass, defatted algae biomass, and crude oil of two strains of Nannochloropsis over 3 years for real-time testing and 6 months for accelerated testing. These bioproducts have been stored at either 5°C, 25°C, or 40°C, and stored either in dark or bright conditions. To determine the quality of the bioproducts, the fatty acid content, protein content, microbial content, moisture, and ash have been measured for the biomasses, and the fatty acid content has been measured for the crude oil. As long as the results of the tests demonstrate that a bioproduct has not changed more than 10% during its shelf-life, it is still of good quality. Analyses from the accelerated tests have shown that degradation of the defatted algae biomass occurs more rapidly when it is exposed to light and stored at 25°C than when it is not exposed to light, or stored in the refrigerator. Analyses on the other bioproducts have shown little degradation after 3 weeks. Since the results from the accelerated tests can only predict the results for the real-time tests, real-time tests are ultimately necessary to truly measure the shelf-life of the bioproducts. This stability program will continue until the program is completed, or until results from analyses show that the biomass and crude oil are no longer of good quality.